Arkansas recognizes the marital property rights known as "dower" and "curtesy": Dower is a wife's right to a share of her husband's property and curtesy is a husband's right to a share of his wife's property. 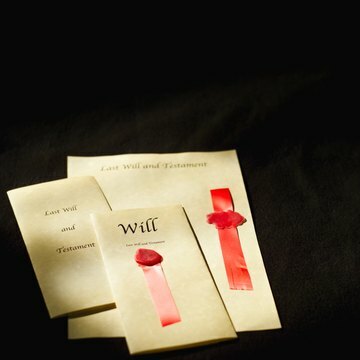 If a married person dies without a will in Arkansas, the surviving spouse automatically receives a one-third interest in real estate for his or her lifetime -- known as a life estate -- if there are no children. Regarding assets other than land, if a decedent leaves a surviving spouse and no children, the surviving spouse receives all assets if the marriage lasted for three years or more. In Arkansas, when a resident dies with no will, his children are entitled to part of his estate. For example, if a decedent has a surviving spouse and children, the children share a two-thirds interest in real estate equally while the surviving spouse receives a life estate in the remaining one-third. However, the children's two-thirds share in real estate is in fee simple, not a life estate. This means the children may leave their interests to someone of their choosing in a will, while the surviving spouse cannot. Arkansas' intestacy laws dictate that the parents of a decedent receive a share of their child's assets. For example, if a decedent was married less than three years and has no children, his parents receive one-half of his personal property assets; parents are not entitled to a share of their children's personal property, however, if their child leaves a surviving spouse and was married for three years or more. Arkansas' laws of intestate succession give a decedent's siblings a share in personal property under certain circumstances. For example, if a decedent has a surviving spouse, no children and no living parents, siblings receive the portion of assets that the parents would have received. In other words, if a decedent has a surviving spouse -- to whom he was married for less than three years -- no children and no living parents, his siblings receive one-half of personal property assets.